Though it had initially been conceived as an infantry support vehicle, the StuG III evolved into a hugely successful tank destroyer when armed with a 7.5cm StuK antitank gun. However, Sturmgeschu"tz units were quick to recognize the need of a heavier weapon. Thus, an order was placed in 1941 for the leFH18 gun to be mounted on the StuG chassis, with delivery of the first production vehicle occurring in March 1943. This new vehicle was known as the StuH42 (Sturmhaubitze). The key difference was the new gun, altered gun mount and rearranged internal layout for the larger 105mm rounds. 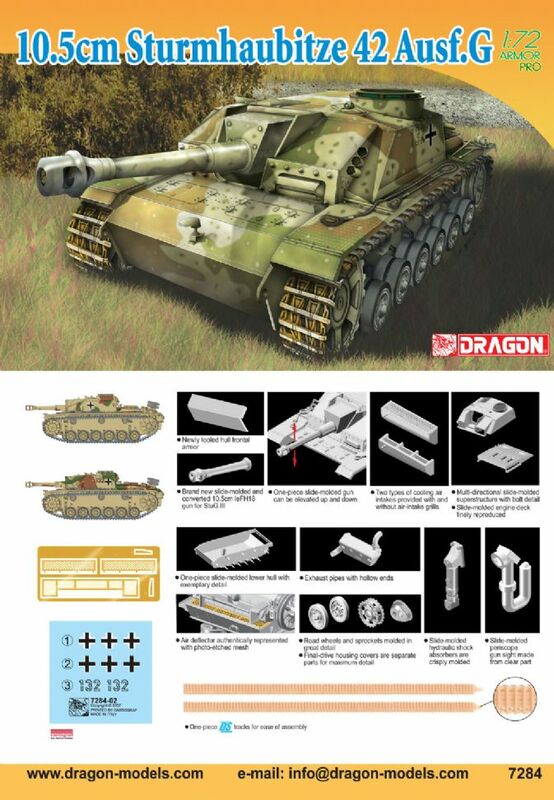 Modelers were delighted with Dragon’s previous 1/72 scale StuG III kit release, and the StuH42 has been added to the range, based on the StuG III Ausf. G variant. It has all the excellent features and high-quality components of the earlier release, but obviously with a newly tooled 10.5cm gun. Slide molds are commonly used for parts such as the one-piece lower hull, and photo-etched items and clear plastic are also used where appropriate. These self-propelled guns offered heavier firepower to StuG detachments, while this StuH42 offers modelers the ideal vehicle to reinforce their collections of WWII German vehicles.